February 2015: The entrance to the Source was removed by the Jerusalem UFO from Temple Mount to the Copenhagen Synagogue awaiting for my return. The UFO was “the light of my mother” and it hovered for 23 seconds right above the Dome of the Rock in Jerusalem, Israel, January 28, 2011. The UFO is the same “birth star” on the sky as over my home in Denmark, which is announcing my “new birth” to the world and showing the direction to me as the Son of God. It was seen by multiple witnesses and filmed by five different video cameras, see further below, including one government hoax trying to discret the whole event. Eligael, who filmed and realeased the first video, felt a “sudden urge” to start investigations in a greater detail. He went one month after the event to the Western Wall where he “found a lead to a witness”, who had recorded the UFO up-close and on March 19, 2011, this video was also uploaded to the Internet. This video 6 includes up-close pictures of the UFO and a “mysterious” monk, who was God briefly alive bringing the final battle of the end times between all light and darkness to the world. The outcome would either bring eternal survival or a new Big Bang to end the world (read my daily scripts telling the story). It brought us survival and eventually our New World :-). Update July 2, 2014: “I was shown myself pulling up my inner self from a hole in the ground, and this is the last (of all force of the Source) that we are now pulling out, and this is from the Temple Mount in Jerusalem where the UFO hovered over in 2011 to open for me, and yes, making the monk get out, and this was the Source/my inner self as darkness because the world was turned around thus receiving the force of the Source as darkness and not light”. Update 2018: As God, I am merely a “simple monk”, it is time to show myself including all, we will start opening to all, then I can come forward :-). 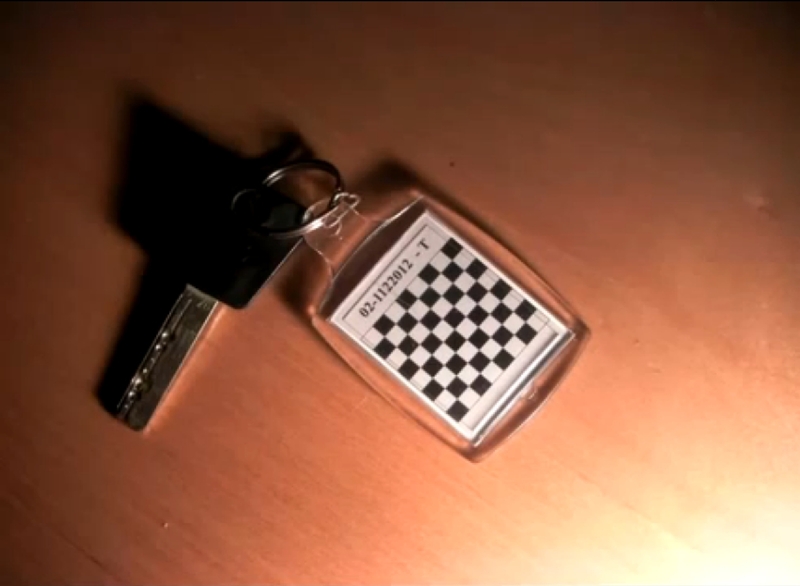 The keyring of video 6: Different parts of God will be united as ONE GOD and we will change from three to four dimensions. 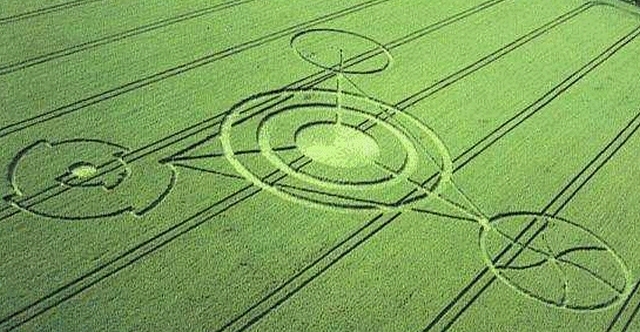 The mother of all crop circles gives the messages of the Jerusalem UFO carrying the same diagram on its underside! The underside of the UFO is an EXACT match to the Barbury Castle Crop Circle from 1991! “It was like the ball came down, left a note at the Western Wall and returned to heaven” – “we were in shock”. “I know what I and 2 friends we saw with our eyes. All Jerusalem talking about it and you think you invented the wheel here”. Despite of “all Jerusalem talking about it”, most people were afraid to stand forward because of the risk of a “public pillory”. A new witness revealed in December 2011 the “secret of the rock” which is the hole underneath the rock, which Jesus fell into becoming part of the Source inside of it, and it is from here that Jesus was resurrected as my “new self” as Stig. Pictures provided by Allan Clark of the UFO Jerusalem Facebook group show the simple truth that all locations and dimensions of all genuine videos match with reality. What more proof do you need? What you see is what you get, it is that simple to comprehend unless you are sceptical of nature and want to misunderstand! “Ufo Politics” from the same forum did admirable work recreating the entire event in 3D and when following the exact path of the UFO, he reached the conclusion that “it matched exactly with the angles where the videos were taken” and it “only leads us to the assurance of this event reality”. Objective quality work as this is, is what leads to the truth and not “poor work by sceptics”, who blinded by the darkness tried to make the world believe that this was a “hoax”. Allan Clark says about the important video 6 including “the monk”: “I’ve been looking at this main part of the video from the craft coming down to taking back off and I cant find any hint of CGI in there at all” (CGI is “Computer-generated imagery” software applying 3D special effects to films) but still people refuse to believe in this monk because “he MUST be a hoax” (! ), which he however is not; he is merely God showing himself, informing you about the approaching “eternal survival or termination” and telling you about the power of your own sceptical voice not believing in him! About video 4 and what it would take if it had not filmed reality: “The entire Old City of Jerusalem would have to be created in 3D involving expensive and complex software and hardware, highly detailed scenery, animated driving cars, along with all different lighting, glowering texturing, architectural design and landscaping”. Carlos Diaz from Mexico had an encounter with a UFO of pure light in January 1998 that projected the Barbury Castle Crop Circle on the ground. Friday the 28th January 2011 at 01,00, what appeared for most people to be a “ball of light” or a “shining star” first hovered the sky over Jerusalem, Israel, before it within a few seconds descended to almost to ground level just above the historic Dome of the Rock on the Temple Mount, where it hovered and moved slightly for 23 seconds before it radiated a gigantic flash of light illuminating the old city of Jerusalem and did a sudden shoot upwards at incredible speed to the immense surprise of people witnessing it and when their eyes followed the ball of light upwards, they saw blinking red spots on the sky. This was a sight that people will never forget. 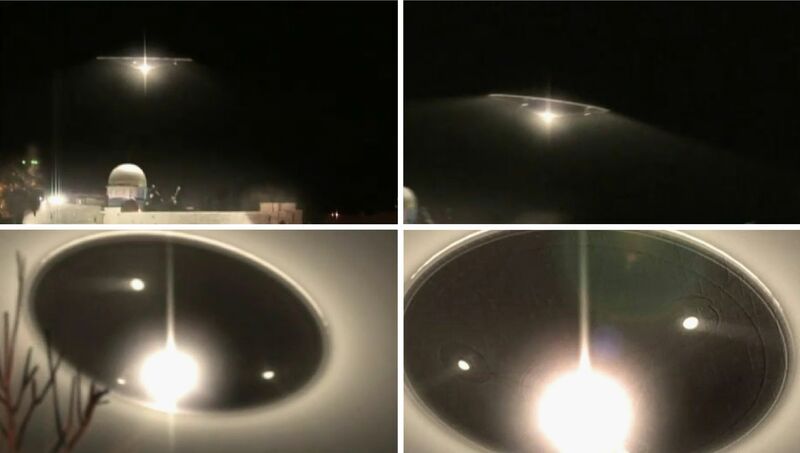 For people witnessing this “ball of light” close by, it was clear to see that it was a small UFO – meassuring approx. 5.5 metres (18 feet) in diameter – which you can see from the picture below and this is what I have called for “the light of my mother” since I saw it the first time myself above my previous home in Kgs. Lyngby in Denmark in 2010, more clearly several times in 2011 and moving with me to my new home in Helsingør from October 2011. This UFO is in direct and constant connection with the holy spirit of my mother, who used to be known as Virgin Mary and will become known to the world as Lona because this is the name of my mother today. 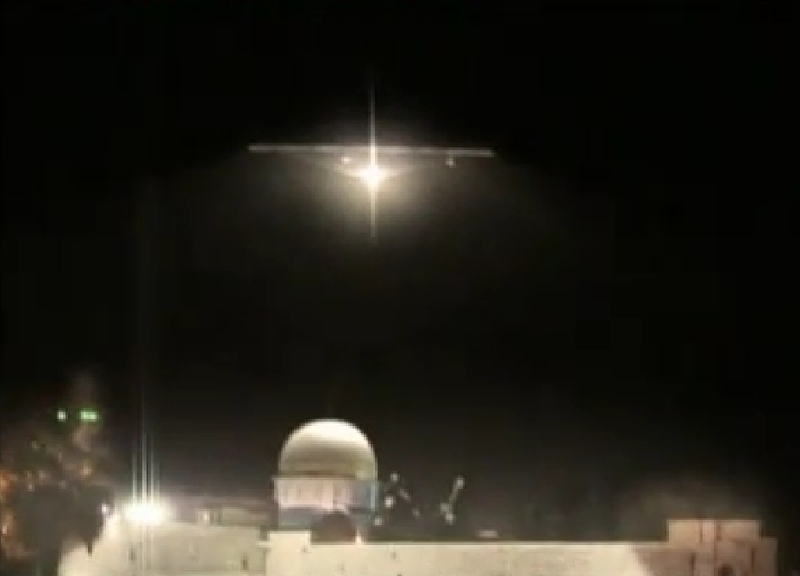 The UFO is identical to the star of Bethlehem leading to the Son of God! 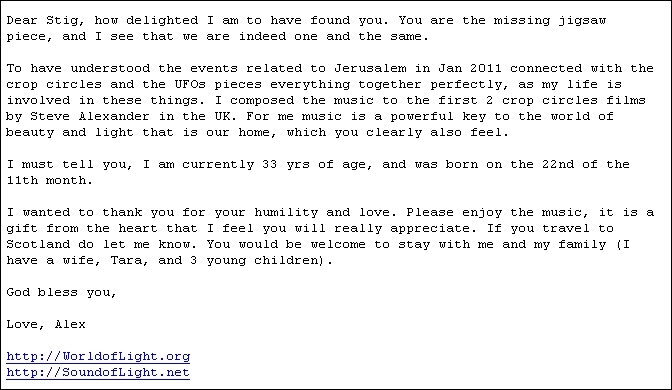 The light of this UFO appearing as the “birth star” on the sky is announcing my “new birth” to the world – as it also did when I was born in my previous life as Jesus – and showing the direction to me as the Son of God as you can read from my website and scripts. “The light of my mother” has appeared on the sky above me in Kgs. Lyngby, Denmark, since November 2010 and it started flying towards me the first time January 7, 2011, very close to my apartment in altitudes of 50-200 metres above ground level as you can watch from my YouTube channel. 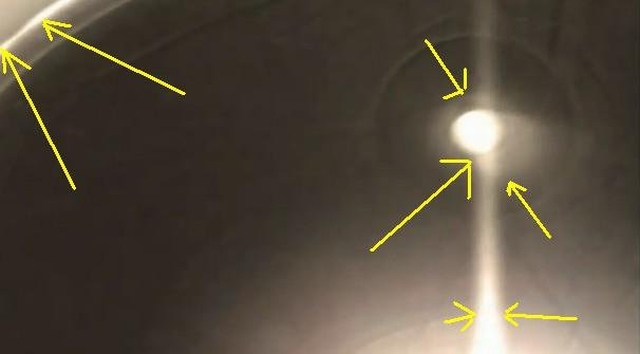 Seen from a distance on the sky, the light appears to be a big shining star and seen up close, it reveals itself as a UFO as it also did in Jerusalem. When this is written in April 2011, I have seen the light myself up close as the flying saucer, which it also appeared as in Jerusalem. The form of the UFO can change instantly and in theory into infinite forms also while you are watching, which I have witnessed myself. 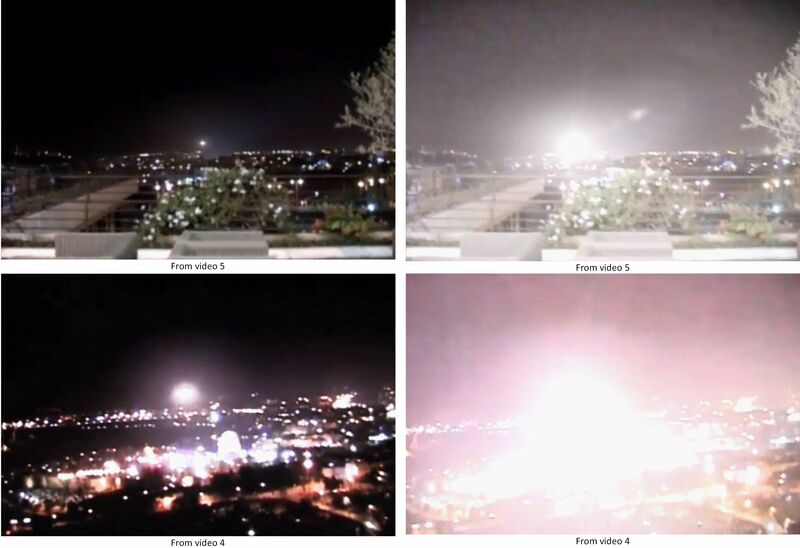 The “shining star” was seen by muliple witnesses and caught on camera by several people independant of each other, who have released their footage on the Internet, which show the exact same sequence of events from different angles and distances as you can see from the following. The video above includes English subtitles. The original video is here in a somewhat shorter version.Please notice the TRUE surprise of Eligael and his friend when the UFO shoots up. The reason why Eligael’s video attracted much attention – more than 2 million views on YouTube – was in part down to Michael Cohen from All News Web (ANW) running the story on their website the 29th January here, but because of a whole hate campaign aimed at ANW by various blogs and web forums, this campaign of hate soon spread to Eligael’s video as it was featured by ANW. A lot of very hurtful comments were directed towards Eligael and his family on his channel by people that were caught up in the ANW hate campaign. In the following interview by Absolute Radio from the 7th February, 2011, Michael speaks about the Jerusalem UFO and tells the “interesting” story of how he the morning after the UFO event was guided by a spiritual voice to locate Eligael’s video on the Internet and to break the story to the world. 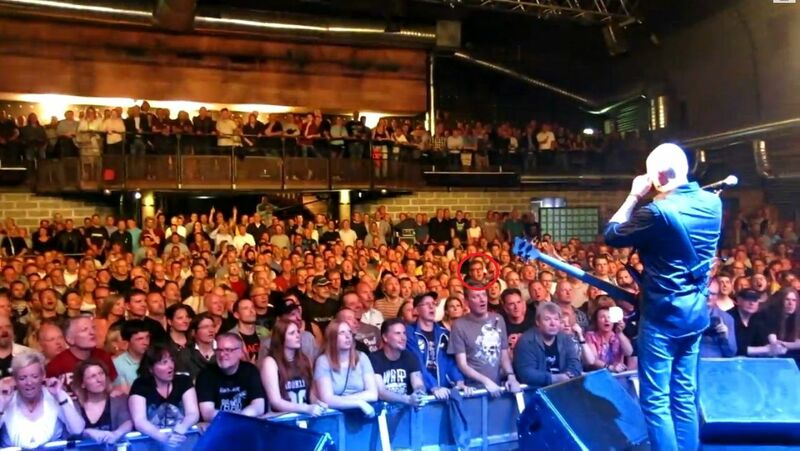 In the interview, he says: “On Saturday morning I woke up with – for some reason two words in my head – go to the computer and type in “UFO Jerusalem”, it ran through my head”. This is how the spiritual world decided to break the story to the physical world through Michael, “my Australian connection”. This video is taken by Eligael’s friend, Shelomy, whom you can see recording it with the camera of his mobile phone in the foreground of video 1. It was published January 30, 2011. This video was published January 31, 2011, and supposedly taken by a group of American tourists. 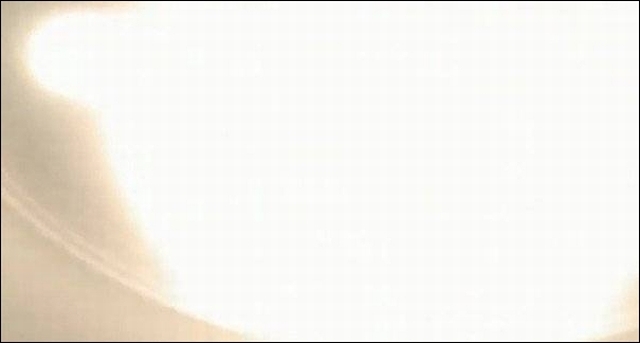 Please notice that the view of the area appears to be static as a photo, with no movement in the picture and that no flash of light occurs as in the other videos, and this is quite easily because this is a video montage made from the following photo, which was uploaded to the Internet already in March 2008 (!) as you can see here. In the video you can hear a woman saying “we’ve seen them in Missisippi”, which is to make fun of the stereotype that suggests that UFOs are only seen by isolated rural Americans in places like Mississippi. This video is easily identified as a hoax; it was made with the intention to be discovered as such with the purpose to discredit and disprove the event as part of the official cover up by “forces, who are not interested to let the truth be discovered by mankind”. Video 4 was filmed by a group of Israeli teens Yuli Cohen, Michael Naumkoff and Dor Tibi after a birthday party, where the driver “by chance” decided to stop the car for Michael to pee, which was at “the exact right moment” giving the group the “opportunity” to film this video and help the world to discover the truth of the event. It was published February 1, 2011, and until the appearance of video 6, it was the best shooting of the UFO. This is the FULL VERSION of the video with the first minutes as a “prelude” before the filming of the UFO begins at 4:25. Do you believe that these first laughing then STUNNED teenagers simply are “good actors” or that they – thus also the UFO – can only be “the real thing” because you have NEVER seen “actors” performing as “natural” and “convincing” as these? 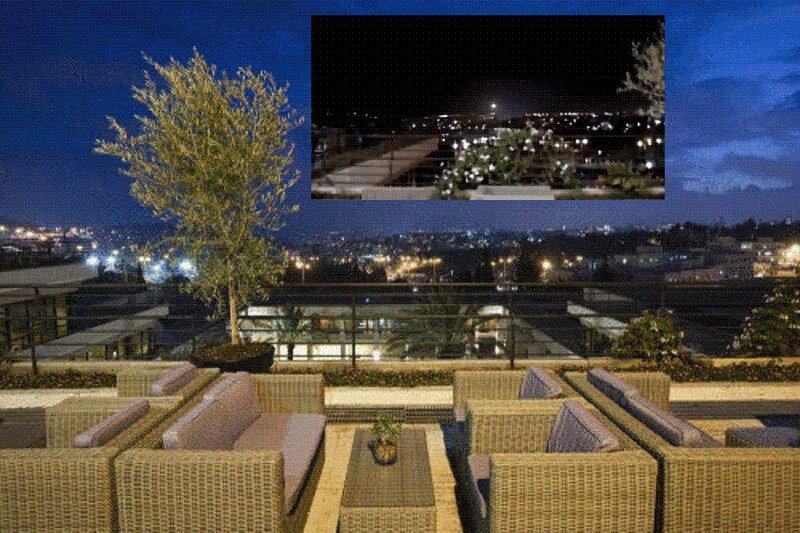 This video – without sound – was taken by a Palestinian from the terrace of the Regency Hotel, who published it March 5, 2011. 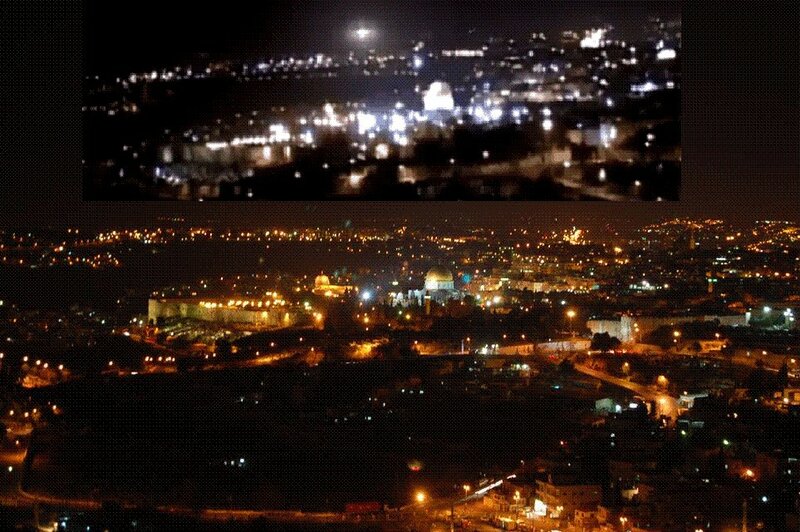 On 28.01.2011 I was a witness to an UFO sighting over the Dome of the rock in Jerusalem. Since that day my life changed until I’ve got a suden urge to investigate the meaning of this message…. I was at the Western wall tuesday night but the religious authority with the police didn’t let us to interview people around there, despite this I hope I found a lead to a witness from the 28th . This case is very sensitive according to the population type. I hope I’ll have some development soon. I’ll upload what I filmed tonight or tomorow. 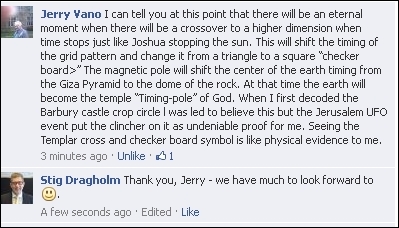 “Last week I filmed with a photographer in the Western wall looking for new evidences about the Jerusalem Ufo. After the police and the religious authority didn’t allow us to shoot and took us out from the area, I was lucky to find some lead to a new important evidence.” and on Facebook, he said that “I am very anxious because it might be in our hands a lead to a new witness who saw the ufo from he Dome of the Rock”. A friend dancing and singing in rejoice and saying “the whole world is going to sing na nak and everyone is going to be happy and there is going to be no more wars” and also that this is a sign of “the ruler of the world”, which it indeed is :-). 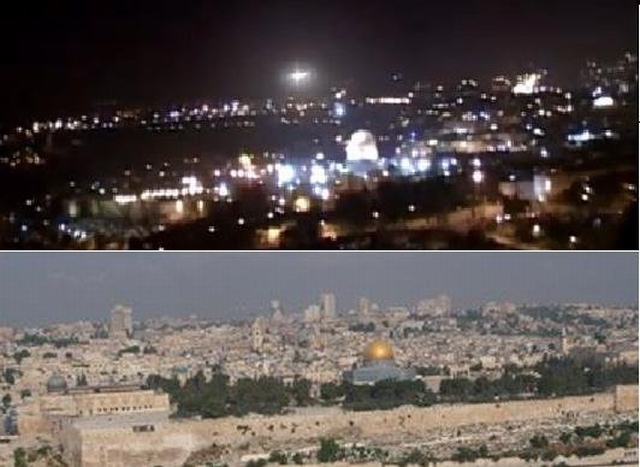 From 1:14 to 1:29 in the short version or from 2:24 to 3:00 in the full version, the “Jerusalem UFO” or “the light of my mother” – not a helicopter as one says – is showing again blinking on the sky the same way as I see it – or other UFO’s – daily on the sky over my home, which I however cannot show you because I do not have a good video camera and because the camera of my phone cannot record it. Then came an ultra orthodox man and told us that a friend of another friend is a witness who saw the object “very close”. The man was afraid to talk and we had to stop shooting. He took my phone number and said he would give it to his friend. Now we are waiting for the call ….”. 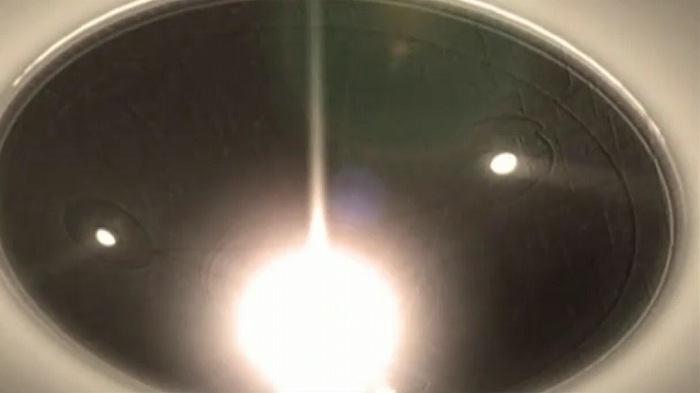 VIDEO 6 – the most important filming of a UFO ever! As you can see from this question and answer the day after, Eligael could not answer who the witness is, which is still to be revealed to the world: Who is the cautious “friend of the friend” of the “ultra orthodox man”? And this introduction to the video, where you will notice how his original “excitement” now has decreased, which may be because of the negative comments from people on your YouTube channel and videos, and also because the “part of the Monk” was difficult even for you to believe in, Eligael, when you saw the full video (?) and eventually he decided to remove the video from public viewing!!! On December 12, 2011, I decided to upload the full version of video 6 myself (above) to the world, because first Eligael and then another I had linked to decided to remove it from the public. This is the text I included as my comments to the video on YouTube. 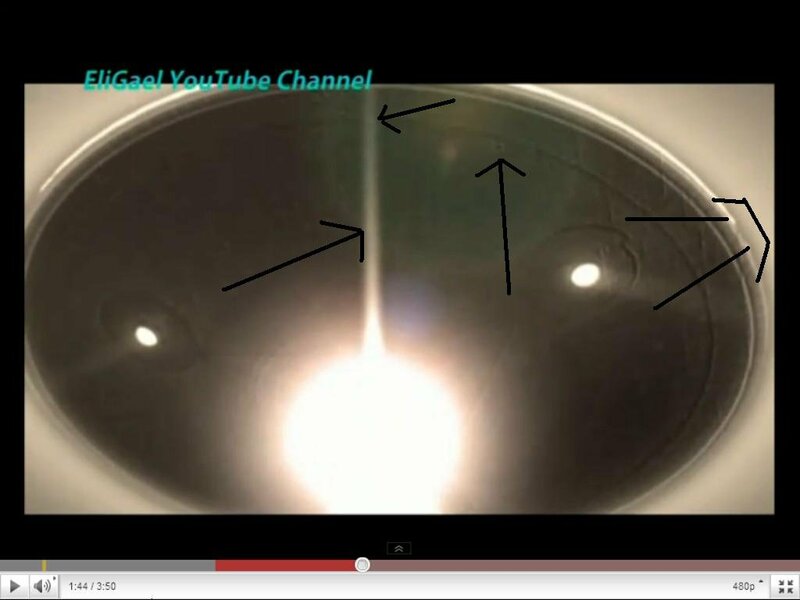 This is the full video 6 of the Jerusalem UFO of January 28, 2011, originally uploaded by the key witness, Eligael, and removed again because of his “lack of faith” influenced negatively by non-believers and “ignorant people” believing that the “strange” monk in the beginning of the video “clearly” made the video and the entire event a hoax, which it certainly was not. The monk was God briefly alive as a human being with the dark side of him deliberately trying to discredit the true event (!) and bringing all darkness to the world after the UFO had opened the centre of the Universe and brought all light to the world at this exact location in Jerusalem, the Dome of the Rock on the Temple Mount. This was the arrival of the final showdown of the end times, which would either lead to eternal survival or termination (a new Big Bang) of mankind and the entire world, which mankind however “could not” understand also because the monk “helped” to remove the attention of the world from the best filming ever of a UFO (!) – how could a “strange monk” make you completely blind and deaf not seeing and understanding what you clearly saw (?) – and the diagram on its underside (a replica of “the mother of all crop circles” at Barbury Castle in 1991 – see here) informing mankind of the creation of a New World, if I — God alive as a normal human being — would be stronger than the darkness taking on “unbearable sufferings” herewith converting darkness to the light of our New World. My upload of this video symbolises the end of my fight with light being victorious. 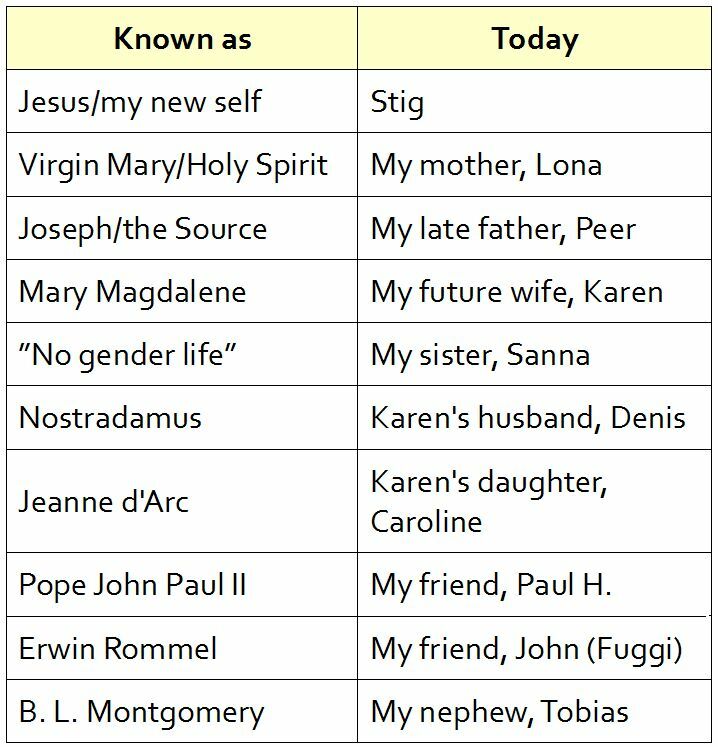 I will now become my “new self” and open our New World, which you can read more of from my website https://stigdragholm.wordpress.com/ and from the long version of this text included at my Jerusalem UFO website, which brings you the truth and the full story of this UFO event as the only website on the Internet! 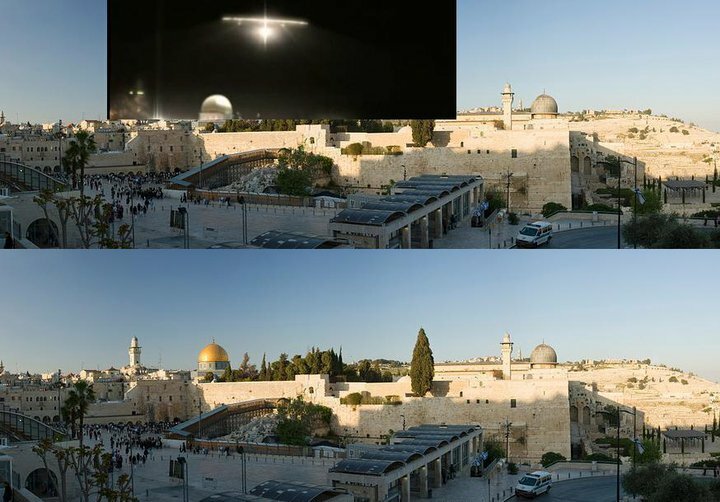 This is the full video 6 of the UFO over the Dome of the Rock in Jerusalem from the 28th January 2011, which was originally uploaded the 26th March 2011 by Eligael (the key witness of the event, who filmed and uploaded video 1, but Eligael later decided to remove the video from public viewing because he had started to lose faith in it himself because of negative influence of thousands of people harassing and telling him that it was not to be trusted because of the “strange” monk appearing in the beginning of the video, who everyone “easily could see was a poor actor” (!) 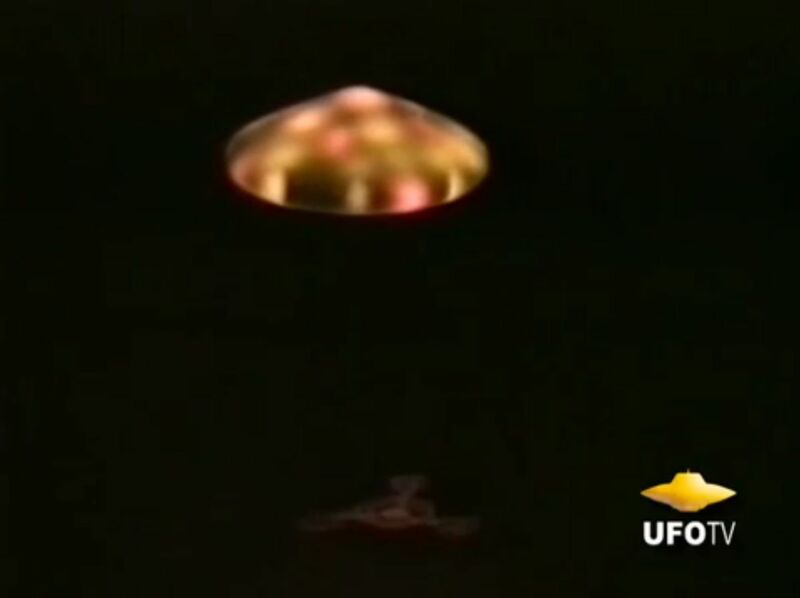 herewith entirely removing attention from the amazing close-up footage of the UFO itself , which however was the best proof of all of the event, thus making it “almost impossible” today to find this video on the Internet because of the discredit it WRONGLY received. This was truly a shame because the monk was God self (!) or let me say that it was the part of God, who has been trapped inside of darkness for an “eternity” with darkness being an unexpected part of creation itself, which included the possibility of “nothing” self to intrude, which it did “unexpectedly” overtaking the greatest part of God and forcing God to act as the Devil tormenting the world with the ultimate purpose to destruct “everything” in order to return to the “normal condition” of darkness, which is “nothing”. 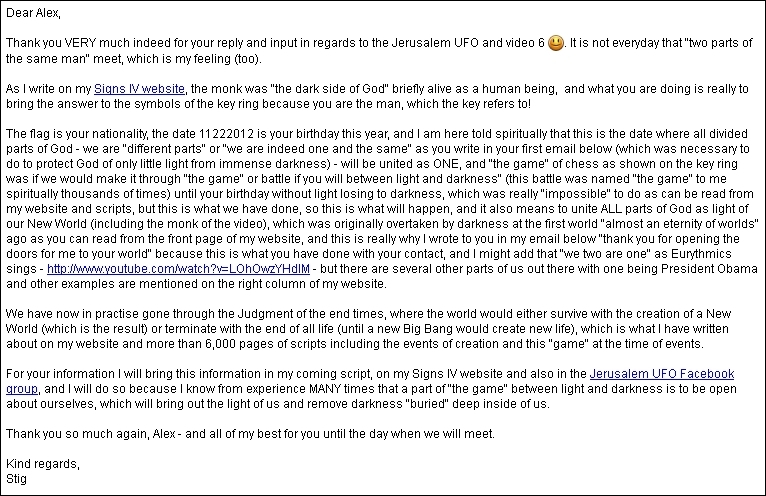 The monk brought all light and darkness to the Universe after “all energies of all times” had been opened by the light through this UFO opening the centre of the Universe located at this exact place in Jerusalem with the purpose to bring the final showdown of the end times of the world between “light and darkness”. 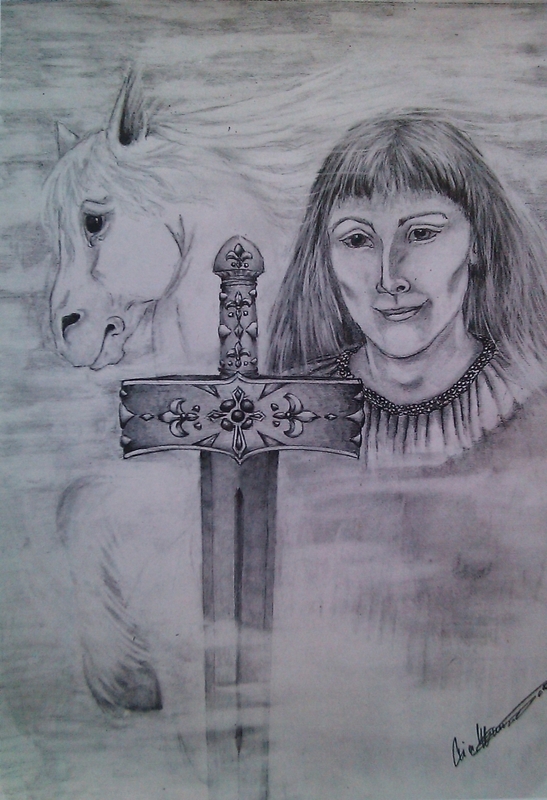 It was my destiny as God alive as a normal human being – please read and understand my website https://stigdragholm.wordpress.com – to carry out this final showdown representing both sides of God carrying everything of both light and darkness inside of me, and If I was able to endure and outlast “unbearable sufferings” brought to me by the dark side, I would manage to convert this darkness into light through the Source of light working spiritually inside of me and to use all light as building stones to create our New World, and if the darkness was too strong for me to handle, it would mean the end of the world creating a new Big Bang as the result. When the full version of this video is “more than difficult” to find today, I have decided to upload it myself as a symbol to tell the world that I WAS STRONGER THAN THE DARKNESS herewith liberating the world and the part of me, who used to be the monk trapped inside of darkness, from all darkness, and bringing the New World of incredible joy and happiness to everyone without any negativity at all (!) due to the elimination of darkness, which you can read the full story of from my website. This was the story given to you, but I had to bring you the “evidence” myself as a normal human being – when no one else could even though everyone could have done what I did (!) – to make you understand. Mankind was not “able” itself to understand because of poor communication, “inability” to read and understand very clear signs given to you (public on the internet for everyone to find, understand and present as I did myself) – including my own website since February 2010 informing you about the events as they happened including the showdown and the new creation through my daily scripts (!!!) – and this was simply because of your poor work, carelessness, ignorance but still very strong and better-knowing voices telling you to write off not only this video, but in practise the showdown of the end times. Mankind was not “able” to understand our forthcoming eternal survival or termination (i.e. a new Big Bang), and instead you kept on “living” as if nothing had happened! You did not “discover” the arrival of the end times including the judgment, however your “leaders” knew without having “the courage” to tell you (!) , but I am happy to tell you that I managed to be victorious converting all darkness to light and to save everyone from termination. There will be NO separation of “sheep from goats”, everyone will become HAPPY in our New World, which will open “now”. I will become the result of my own creation, which is the Son of God being “everything” of our New World including the resurrected soul of Jesus, who was terminated 2,000 years ago. This is the man I now will wake up as to open the New World for you. Update November 2013: “It was me being the Monk, this is how I looked like when bringing out all darkness of the world” as I am told spiritually, which is what subsequently was sent to me as Stig to absorb as my sufferings and to transform into light as building stones of our New World as you can read about from the front page of my website. I have received all of this energy as my sufferings turning around and saving all life self inside of the Source as you can read from my website/scripts, which has now ended when these words are written. January 2, 2018: I am signing off, and I am here given ”King” by UB40 from their magnificent debut album ”Signing off”, and yes, this is how it is to be me, ”King” as some will call me, but I feel Himalayan monks and myself in a simple brown monk-dress, because this is what I think of myself, I am merely a ”simple monk”, so there you have it :-). February 20, 2018: I was shown the face of the Source inside the hood of his monk dress, now it is time to show myself. 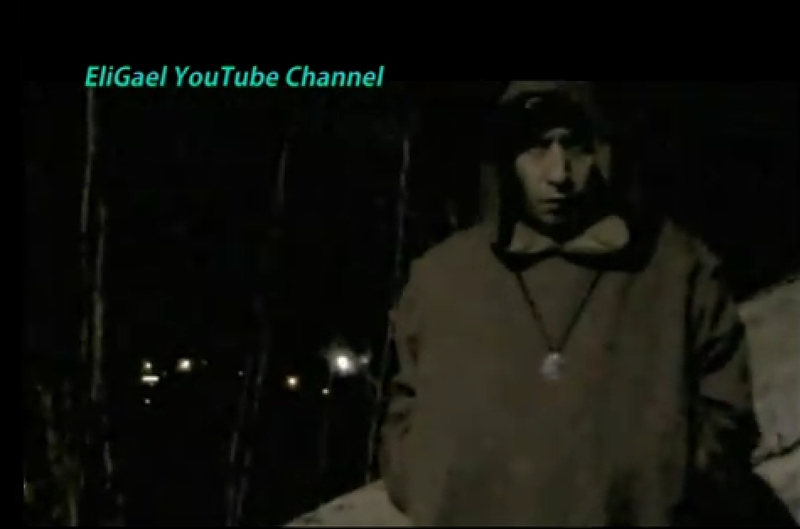 Yes, this is the man, my new self including all, as you can see in the Jerusalem video from January 2011. May 10, 2018: I was shown a locked store room, which is being opened, this means that we will start opening to all. Then I can come forward, I am shown the monk from the Jerusalem UFO video no. 6. I am with all, when making love, i.e. bringing the force of the Source for creation. As you can see from video 6 above, God alive as the monk dropped a key with a message, which made Eligael ask this question: “Where this key lead”? 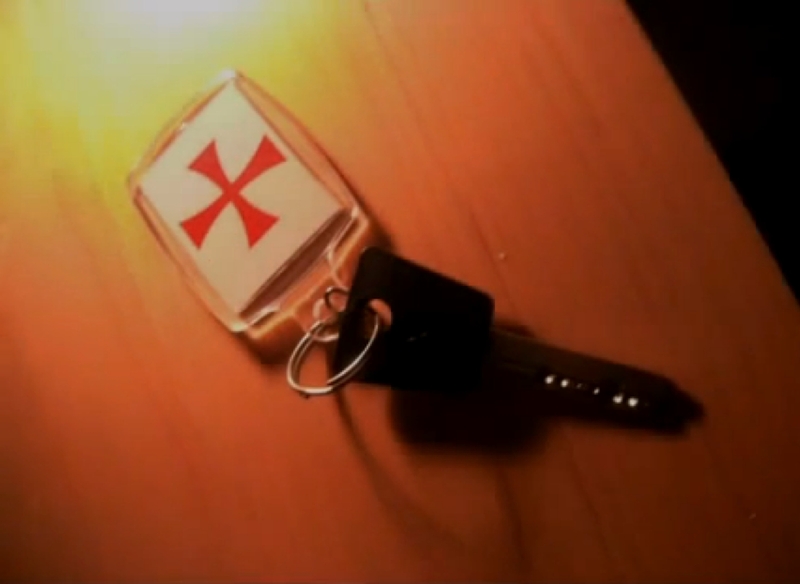 In short, the keyring means that November 22, 2012 is the date where all parts of God alive today inside several human beings will be united into ONE GOD in connection with the creation of our New World. And with this email, I could send him my reply August 27, 2012 with the full understanding of the keyring. 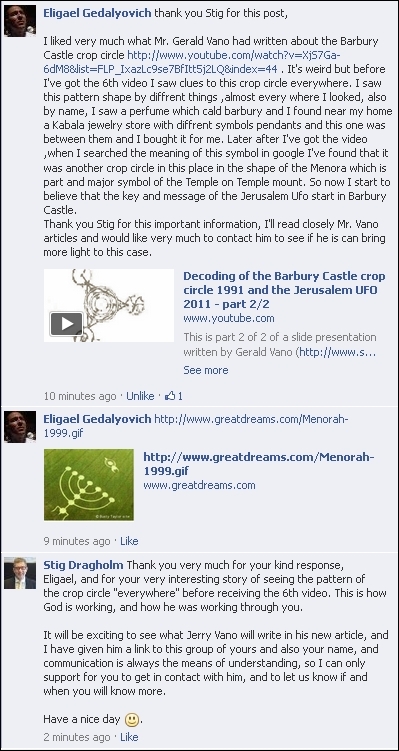 This brought Eligael back into the game March 26, 2013, now saying that before he received Video 6, he saw the pattern of the Barbury crop circle “everywhere”, and “now I start to believe that the key and the message of the Jerusalem UFO start in Barbury Castle“, which is what I have told you and the world about since 2011!!! On March 28, 2013, Gerald Vano elaborated on his message. The underside of the UFO is an EXACT match to the Barbury Castle Crop Circle! 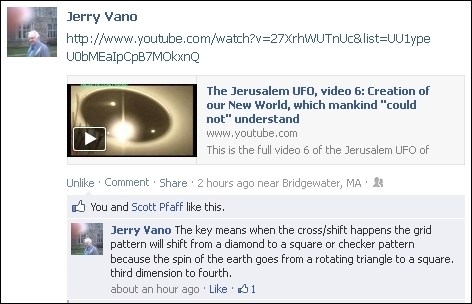 The underside of the Jerusalem UFO is an IDENTICAL match to the Crop Circle! Sceptical people together with UFO-forums and media used as part of cover-up almost killed the voice of truth – but not mine! 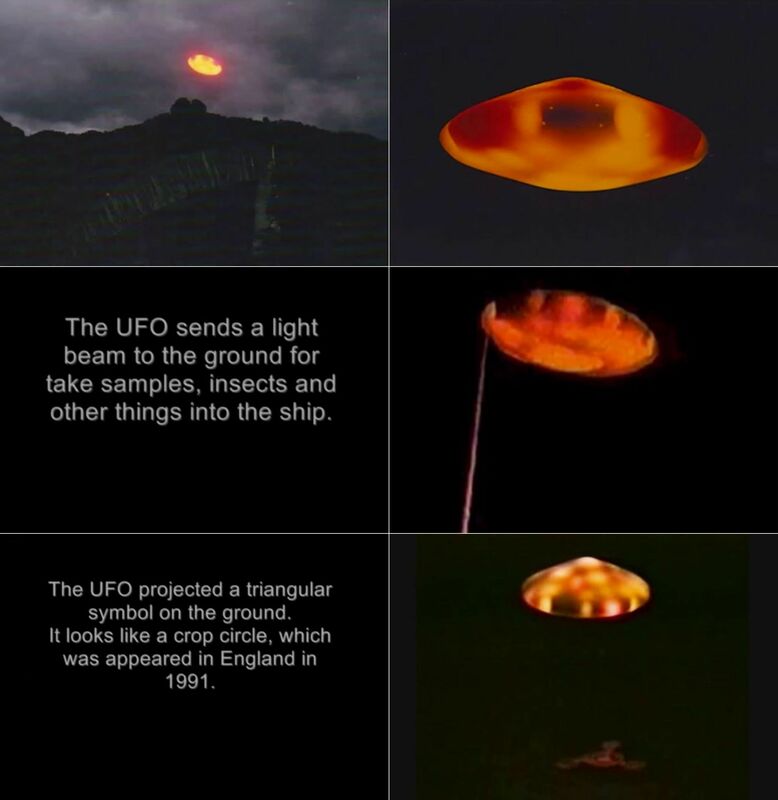 What gave extra “credibility” to this UFO event is the precise fact of “not just one genuine video”, but by the existence of “others” from different capturing angles and different people and also “other witnesses” as you can see from the chapter below, but still sceptical people and UFO forums – some “bought” or even run by the “official world” as part of cover-up (!) – could not believe what they saw with their own eyes (! ), thus deciding to “debunk” the video evidence, which “could not” be debunked because it merely shows the truth. In the process of doing so, these people/forums made up their own “evidence” and stories for example of video witnesses being united in a conspiracy against mankind (!) – why should people want to go to so much trouble to produce “impossible to produce film” if it was not the truth (?) – and the only problem is that the “evidence” of debunkers does not exist, it is all in the imagination of ignorant and deaf but still better-knowing people (some having “hidden agendas” to spread a lie of this event to the world), and together with media also covering up the event on order of the “official world”, the voice of truth was almost killed with mine being “among the last” to tell the world what really happened with the best information on the Internet included on this very site. The world had “accepted” that the Jerusalem UFO was a hoax, and begun to ridicule and spread hate towards witnesses (look at the hate, Eligael received! ), videos and the entire event, and this is despite of what EVERYONE can see with their own eyes, which is that THIS CAN ONLY BE THE TRUTH AND NOTHING BUT THE TRUTH but still, the world “could not” understand it! In the following chapters I provide more evidence to support this event, and please remember that the entire world could have decided to do as I to collect evidence documenting the truth of this event, but eeeeehhhh, no one did or “could”! I provide this map to show locations and statement of witnesses standing forward in order to give you a clear overview of the event. I recommend you to view the detailed larger map to obtain all information. 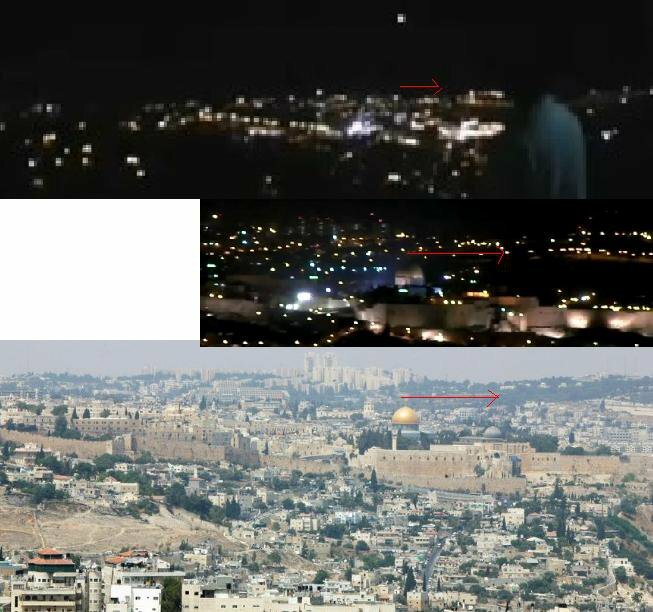 Please notice that video 3 is NOT included in the map since it was an intentionally created hoax, and the webcam of the Jerusalem Weather Station is only included to show you that it did NOT capture the light of the UFO as some claims, because the old city with the Dome of the Rock is not visible inside of the picture of the webcam. When it comes to the Jerusalem UFO, the simplest answer IS the truth, which is that “what you see on the videos is what you get”! This should be simple for everyone to watch and understand and this is furthermore supported by the other witnesses included at the map above, who decided to stand forward, and even though “all Jerusalem talking about it”, only few decided to stand forward because they did not want to become ridiculed by sceptics not believing in UFO’s and also because of fear of reactions from the public including the media and maybe even from the government, because it decided to be silent in relation to the event, and to let the media report that it was “nothing” (!) and furthermore, this happened at a “holy place” of significant importance to different religious faiths and the government, and “you don’t want to mess up with these people telling stories of this holy place, which they do not speak about themselves”. As part of the key witness Eligael continious “drive” to keep looking for “answers”, he returned to the old city of Jerusalem, and did what the media should have done; find a new witness, and this witness was not only willing to stand forward to confirm the story but also to reveal “the secret of the rock” as you can see in the video below. “Through a mysterious person I’ve got connected by walking at the lanes of the Old City of Jerusalem and led me to the heart of the Muslim Quarter for a meeting with Bilall; the merchant of the most beautiful textile I ever saw”. In his video no. 2 uploaded the day after the 3rd December 2011, he gives this introduction and you can hear the testimony of the witness from the video following it including his revelation of the “secret of the rock”. 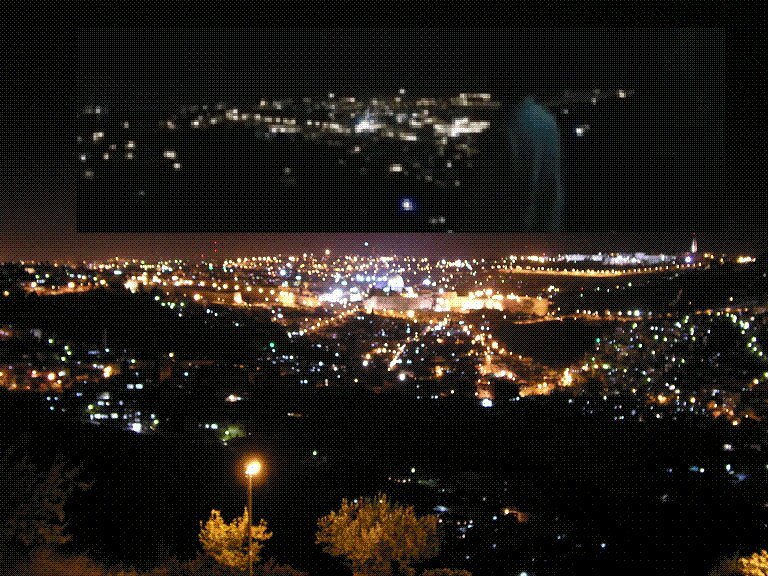 “This is the first meeting with Bilal from the Muslim Quarter in Jeruslem who decided to break the silence about the ufo phenomena in this area. Bilal also revealed a great secret about the Rock which may be the reason to all the ufo’s phenomena in that region. Now he want to ask the Imam for this meaning and I hope he will get the premission to continue . I hope it will create a new kind of cooperation between us to reveal the message”. Around Christmas 2011 I was spiritually told that “the secret of the rock” is the reason why the previous Prime Minister Ariel Sharon visited the the Dome of the Rock in 2000, and I shared the following message with Eligael and the Jerusalem UFO forum the 31st December 2011 and was at the same time spiritually told that after I was killed as my previous self, Jesus, I “fell” into the hole/tunnel underneath the rock leading to the Source herewith becoming terminated or “nothing” when returning to a condition of “a being inside the light before creation”, and it is from here that I was resurrected back to physical life as my “new self” as Stig. This was the well-kept secret, which was “impossible” for Muslims to share with the world, but now I have done it for you using some “strange magic” and “a little help from my friends”, which will now make it easier for you to confirm/reveal to the world when you will open up the rock for the world to see? 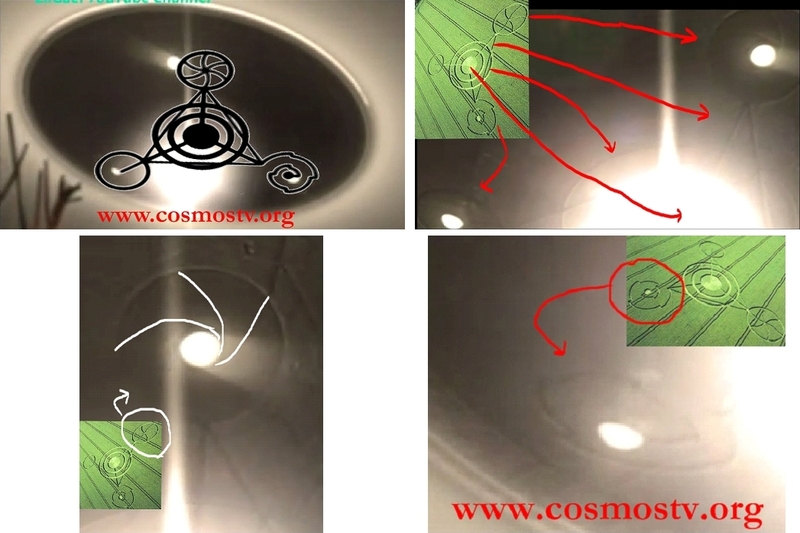 The following pictures were provided and commented by Alan Clark from the UFO Jerusalem Facebook group at the end of March 2011 and they show the simple truth that all locations and dimensions of all videos – except the false video 3, which is ommitted – match with reality. What more proof do you need other than this? “We recreated the entire event in 3D Animation over the Mount of the Temples. We reproduced the architecture of all the temples and buildings within the Mount, the Landscaping and the Topography of the surroundings and Horizon from the Cameras point of View from the main Three videos. All based on the original Architectural prints”. “We found many issues and facts that only leads us to the assurance of this event reality…”. 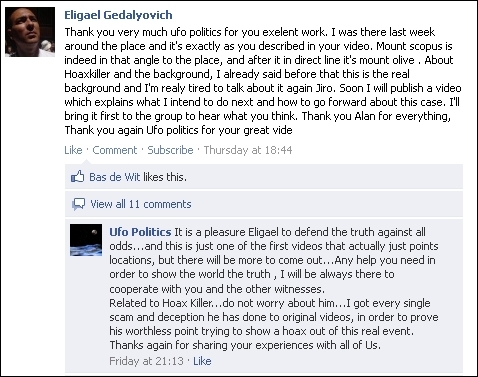 The video led to the following comment by Eligael confirming that “it’s exactly as you described it”, and from this conversation and MANY others primarily by “UFO Politics” and Alan Clark on this forum, you will understand why other videos trying to convince people that the Jerusalem UFO was a hoax are NOT true, and you will learn that the difference is that the people on this forum work professionally and objectively, which is leading them to the truth on contrary to what many others of the “UFO-community” does, who was led by a “strong inner voice of the darkness”. There is “no hint of CGI” in video 6, but still people refuse to believe in the monk when using their mind! Alan Clark looked into video 6 in a greater detail and as you can see from his following conclusion, he could not find any “hint of CGI” (“Computer-generated imagery” software applying 3D special effects to films) but despite of this, his “mind” could simply not believe in the “monk part at the beginning” as so many others find “difficult” too – but when everything else that you see is true, it should be simple logic that the Monk is also true? “Too many errors in the craft..the render time would be horrendous to track all those errors with the lens flare and the glare off the lights..and thats just in one still there are more as the footage goes on, if it were fake the detail would be consistent and not so varied and random, the lens flare passes through the lights with no cgi effect detectable and on the very last frame the 3 lights come together at the point of take off, they stop rotating and turn to the middle light before it shoots up..thats an awful lot of work if this is cgi and a lot of very expensive equipment too..if you can find the cgi show me….!! 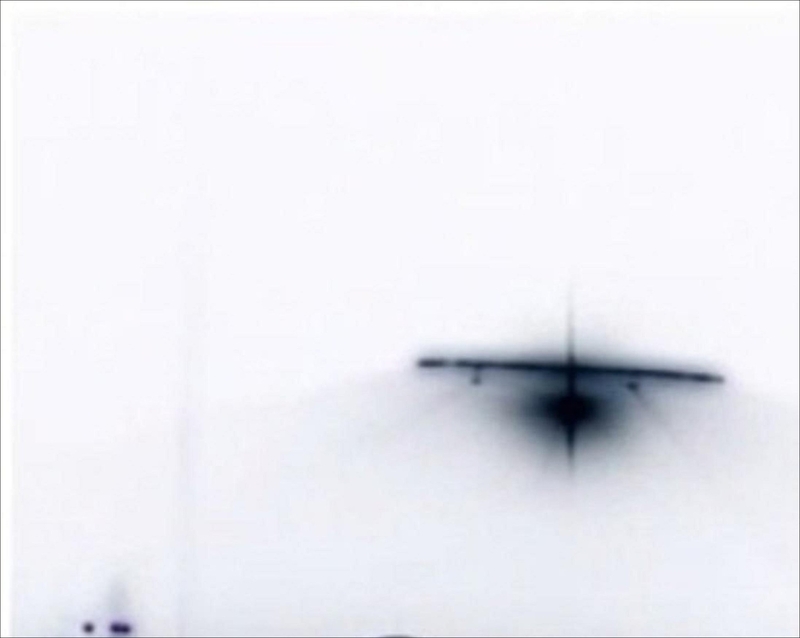 “Even at intense light we can still note the shadow-profile from vertical objects further away from light source, however, the horizontal street plane lites up also gradually upon the light from UFO, like it is in reality, therefore no “fake 2D Dynamic background could ever give this results”. “Pay close attention to the reflective properties emanating in and around the light source, you will see that they are very consistent, if you look particularly at the buildings and in particular the temple itself you will see that everything is very consistent, the amplification and the reflection of the light source is consistent with the amplitude of the light source and the flash”. “Focus your eyes on the temple around temple Dome, you will see that the increase in brightness reflects the increase of brightness of the light source or the flash” and later “this I think is very convincing of a source that is actually there, hasn’t been super-imposed, hasn’t been created by CGI etc.” and “you will see that the area that it covers increases and decreases exactly according to the amplitude of the flash burst” . “Using editing software I have enhanced the original footage to clearer show the fluctuations or the flame like emanations from the light source, now in my opinion to create this frame by frame this kind of flame effect, if you look very closely at the kind of wing like aspect of the source you will see the little triangulations, the little fluctuations, now to create that using to say a computer would be very, very difficult, you know it would take an awfully lot of time, now that appears as thought it’s be random in nature, just much like what you would see from a fire or a flame, each frame you will see has various kind of different frequencies if you like or patterns emanating from it, to do that pixel for pixel, frame for frame in that randomness would be very difficult if at all possible indeed, so this is why I am of the opinion that this is a genuine light source that is appearing over the temple mount itself”. 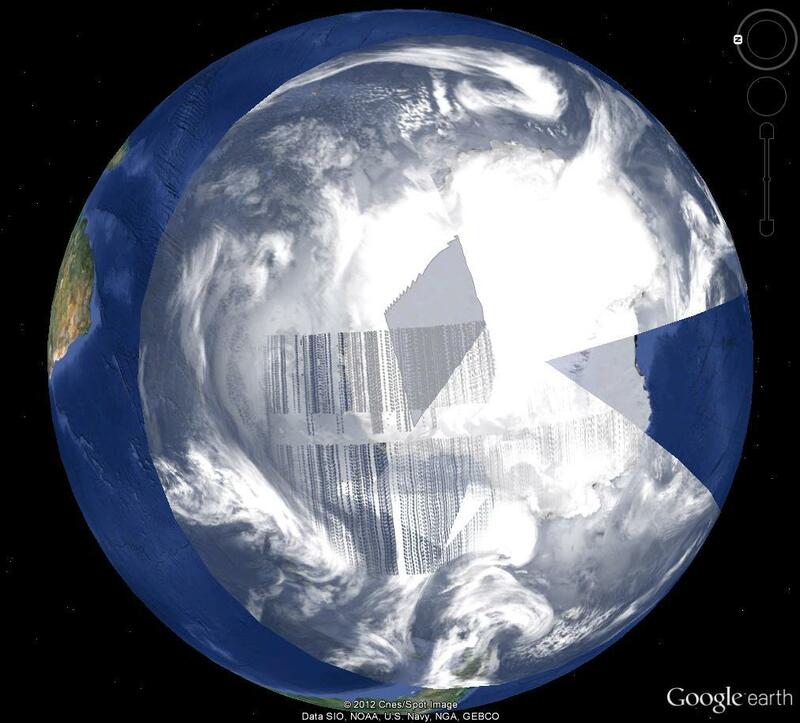 Read more about decoding of mother of all crop circles/Jerusalem UFO here. This website was first published April 2, 2011, and has since been updated some times.